Waterford await Galway in Saturday’s All-Ireland U21 decider. 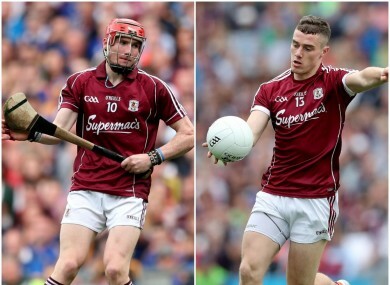 Conor Whelan and Eamonn Brannigan part of the Galway U21 setup for Saturday. GALWAY STAR FORWARD Conor Whelan remains a major concern for the Tribesmen as he battles injury ahead of Saturday’s Bord Gáis Energy All-Ireland U21 hurling final. Whelan damaged his shoulder in their semi-final win last month in a collision with Dublin defender Shane Barrett and there remains uncertainty about his availability. “It’s a race against time really with Conor,” revealed manager Tony Ward. “His recuperation has come on well, he’s doing well, we’re hoping, fingers crossed. It wasn’t dislocated, it was just damaged. “He probably did most of the damage by staying on that evening. Look, he’s a tough cookie Conor. We’ll make a decision on it tonight. Waterford’s main concern is over the ankle injury that has hampered senior player Tom Devine of late. One player that Ward definitely has available to him is Galway senior footballer Eamonn Brannigan. A Connacht medal winner in July against Roscommon, Brannigan linked up with the U21 hurling squad in the wake of Galway’s senior quarter-final loss to Tipperary. The Rahoon-Newcastle club man was brought on during last month’s victory over Dublin. “We really didn’t have Eamonn until about two weeks before the Dublin game,” explained Ward. “Eamonn is an athlete, he’s just a pure athlete as you can see from the football. It takes him a while to get his hurling touch going but he’s an option for us. “He did well when he came in. He’s a good lad. We were in touch with Kevin (Walsh) and any time he could, he would let him out to us. “It’s all about managing these guys. It’s different if a guy had an injury or something but this was a guy coming back to you fully fit. Email “Galway U21s worry over senior hurler availability as football forward provides boost”. Feedback on “Galway U21s worry over senior hurler availability as football forward provides boost”.